This race was created as a fundraiser for Interfaith Works Emergency Overnight Shelter which provides critical support for the homeless community of Olympia and Thurston County. A portion of the proceeds from each race entry goes directly to the shelter. Over the past three years we've been able to donate a total of $17,000! Want to do more? Clean our your closets and bring any clean, unwanted shoes, jackets, clothing, sleeping bags, blankets, socks, gloves, and hats to be donated to the shelter. You can also check out their website for a wish list of the items most needed for the shelter. What seems like a little thing to us can mean a big difference to someone in need. Click here to visit their donation page to view the wish list or to donate directly to the shelter. Registration will open in January 5th, 2019 via UltraSignup. There are no finisher medals, but your entry fee includes free food and drink for you and your family/friends after the race. If you wish to add on a race shirt, you can do so during registration. Registered runners who cannot make the race can cancel their registration up to 7 days prior to the race and receive a percentage credit towards a future Rainshadow race. There are no refunds on registrations or shirts. Click here for our full cancellation policy and instructions on how to cancel your registration. Race shirts will be available for purchase during registration. Runners will have the option to add on either a technical style running shirt or a soft and cozy cotton blend tee, both featuring the race artwork designed by Seattle artist, Baylie Peplow, of Red Umbrella Designs. 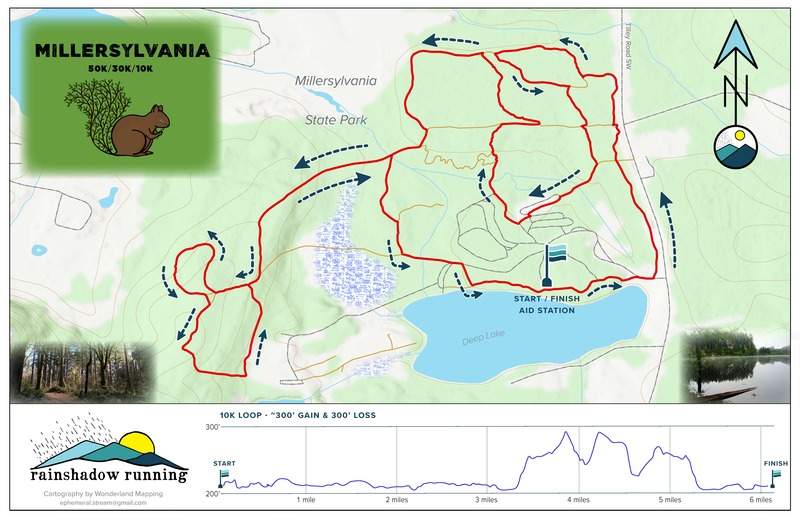 This race course is fun and relatively flat, with only ~300 feet of elevation gain per 10K loop, it makes for a great beginner race or for someone wanting a fast time on a beautiful course. The route is mostly single track and meanders through dense and mossy old growth forest, past lakes and alongside babbling creeks. The 10K will complete one loop, the 30K will complete 3 loops, and the 50K will complete 5 loops. ​Runners have until 4:00 pm to finish the race. ​Click here to view course map. 6:30 am-7:55 am: 50K & 30K Bib pick up at Millersylvania State Park, DON'T FORGET PHOTO ID! 8:15 am-9:25 am: 10K Bib pick up at Millersylvania State Park, DON'T FORGET PHOTO ID! Like any Rainshadow race, we encourage you to stick around and cheer on your fellow runners after your race. We will have plenty of post race snacks and local craft beer. The race finish is set on a lake, so bring your blanket or favorite lawn game (and swimsuit to swim in the lake for the extra brave). The race is family friendly and leashed, well behaved dogs are welcome. Food and drink is free for all runners and their friends or family and volunteers, but unfortunately is not available to the public. You must be a part of the event to enjoy the post race goodies. Thanks for your understanding. We need volunteers to help work the aid station, parking or check-in, the finish/timing table, and post race food. If you are interested or able to volunteer, please email Elizabeth at volunteer@rainshadowrunning.com. All volunteers get to eat and drink for free and earn a discount credit towards a future Rainshadow Running race.